The birth control pill revolutionised women's health - and grew to become one of the most popular forms of family planning. But it is now under attack from pro-life groups in the US. A growing number of doctors and pharmacists are now refusing to dispense it, on the grounds that it is actually a form of abortion. Pro-choice groups fear this new moral objection to the Pill could lead to more unplanned pregnancies, even more abortions. A woman taking the Pill does not usually release eggs. But occasionally she might - and it is possible that egg could be fertilised. The hormonal conditions created by the Pill mean, if that happened, the fertilised egg would not be implanted or survive. Mainstream medicine does not define that as a pregnancy. But some of those strictly against abortion do. Dr Cynthia Jones-Nosacek - a family doctor in Milwaukee - now refuses to prescribe the Pill. She opposes it on moral grounds, arguing it is a form of abortion. 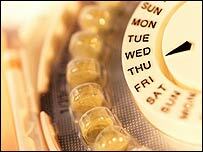 "The contraceptive pill doesn't always prevent ovulation. As often as 30% of the time, ovulation may occur and if that happens, fertilisation may occur," Dr Jones-Nosacek says. "Then there are other mechanisms that can prevent that being from surviving. It's called a chemical abortion." That definition is suddenly gaining support and some pharmacists now refuse to dispense the Pill. Julee Lacey, a mother of two, had used the Pill for nine years when a pharmacist at her local chemist in Texas refused her prescription. "She [the pharmacist] began to tell me she personally does not believe in birth control," says Ms Lacey. "I really couldn't believe she had the right to withhold my medication from me," she adds. At first these were just isolated cases, mostly in the Midwest. But recently they have increased dramatically. Pro-choice groups now call it a significant and growing trend. Lisa Boyce of Planned Parenthood in Wisconsin says it is a conscious extension of the abortion debate. "They've done so much with outlawing and restricting access to abortion that they've set their sights on birth control because there's nothing else really they can do to further restrict abortion here in Wisconsin," Ms Boyce says. "Which is counter-intuitive because if you're against abortion in the least you'd think you would see the value in enhancing access birth control, the very means women look to preventing pregnancy and the need for abortion." And in the run-up to the election, it is a hot political topic too. This year 12 states took steps to try to introduce so-called conscience clauses. They allow pharmacists to refuse to dispense drugs, including the Pill, on moral grounds, without losing their jobs. In Wisconsin, the mostly-Republican assembly passed the bill, only to have it vetoed by the Democratic governor. Representative Curt Gielow says pharmacists should be protected. "There was an incident where a pharmacist who worked in a retail drug store refused on conscience to fill a prescription and that individual was terminated from employment," Mr Gielow says. "That, I believe, set the stage for concern there might be employment discrimination opportunity here if in fact you listened to your conscience instead of doing what the boss told you to do." At the moment, the Pill is hugely popular in the US. But calling it a type of abortion opens up a whole new front in the pro-life, pro-choice debate. This moral condemnation is a fresh challenge to one of the most used, most reliable methods of family planning.